Ni Hao Shanghai – Would You Care for Some Hairy Crab? Three and a half years since I’d embarked on the study abroad adventure of a lifetime to Hong Kong, China and yet my heart still ached to go back. Through nothing short of divine intervention, I found myself in circumstance making the miraculous happen and I was going back to Asia! Shanghai here I come! The question was, would I return this time? Never in a million years would I have dreamed that less than four years later I’d be back to one of my favorite cities on Earth: Hong Kong, China. But it happened. And it was incredible! Can you handle this? My boyfriend, Sean, has a job that requires travel – some of it takes him to places like Baton Rouge and Philadelphia, and some of it takes him a little further afield to places like London and Berlin. It just so happened that a trip in the fall was taking him to a conference in Shanghai, and there was no way in hell I was going to pass up a plum opportunity like that to get back to Asia. Since we were going to be a stone’s throw from Hong Kong, why not swing by there before heading back to the US? Done! 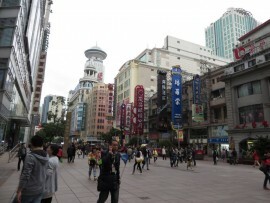 Nanjing Rd. Prepare to meet your many, many friends. 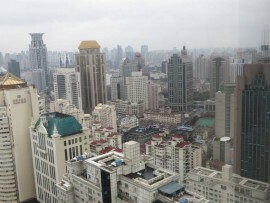 Our view of Shanghai from our hotel room. Wow! So in the middle of November, we were on a plane bound for Shanghai, and aside from the fourteen-hour flight from Detroit to Shanghai in Economy, I couldn’t have been more excited. We arrived around 4 PM Shanghai time (which equates to 3 AM in the US) with next to no sleep, and had the task ahead of us to stay up until at least 9 that night or risk never acclimatizing to the time change during our weeklong stay in Asia. This happened to at least one attendee of the conference who “took a nap” the morning he arrived from Europe and ended up sleeping till midnight and never fully getting on schedule with Asia. Luckily, this proved less difficult than I first feared, because as soon as we arrived at the hotel Le Royal Meridien Shanghai right across the street from the People’s Square Park and backing up to Shanghai’s busiest shopping street Nanjing Rd, Sean’s co-workers, who’d arrived a day or two ahead of us, wanted to go out to dinner. It was to an area I remember fondly in Shanghai, called the Xin Tian Di district, which is distinctive for its obviously European influence: restaurants and streets look right out of a street in a German or French town, right down to the Starbucks. But although we went to a very European-inspired piece of Shanghai, the restaurant we went to was decidedly Chinese. It was an upscale Chinese restaurant called Wu Tong Ju, and I would highly recommend it after dining there. 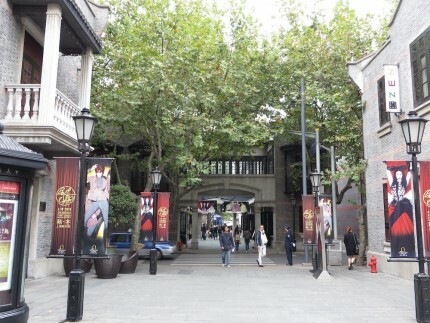 The European-inspired quarters of Shanghai: Xin Tian Di. Since Adam and Soo had been there before, the rest of the group let them do the ordering and we ended up with quite a spread. Champagne and tea, giant shrimp with scallions, Peking duck with plum sauce and pancakes, Xiao long bao – my favorite! (steamed dumplings filled with soup and meat), fried fish in sweet and sour sauce, flash fried bananas for dessert and the piece de resistance for the evening hairy crab. It was insisted that we taste this delicacy of Shanghai’s while it was in season, so we all sampled the crab – which naturally got messy quickly with everyone trying to crack their crab’s hairy little claws open and get the meat out. I’ll be honest I wasn’t a huge fan, the crab tasted fine (even though it looked a little odd with matted patches of fur all over it), but it’s so much work for such a little bit of meat! Everything tasted great though, and I was stuffed in the end. Anyway, after we’d finished our delicious meal, jumped through a number of hoops to pay with an American credit card (Would they really expect eight Westerners speaking strictly English to have anything besides American cards? Really?? 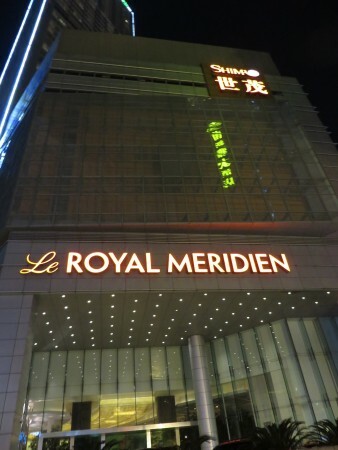 ), and caught a taxi back to the hotel, Sean and I were able to stumble to our room on the 38th floor with the fantastic view of Shanghai, Nanjing Rd and the Pearl Tower, and pass out at the decent hour of 9:30 PM. First day in Asia, success! Stay tuned for the next blog when Sean got introduced to Shanghai properly: aka we went knock-off shopping in the back alleys and he tried the best xiao long bao the world’s ever known. Our hotel in Shanghai. Nice digs – I highly recommend it. This entry was posted in Asia, China, Hong Kong and tagged Asia, China, Hong Kong, Shanghai, Travels, Wu Tong Ju, Xiao long bao, Xin Tian Di on June 30, 2014 by Paige N..